Filing season started January 29, 2018. Affordable Care Act is still on the top of the most frequently asked questions this year. The Tax Cuts and Jobs Act signed into law by President Trump on December 22, 2017 has repealed individual mandate that requires most Americans to carry a minimum level of health coverage effective Jan 1, 2019. However, taxpayers who didn’t obtain medical insurance coverage in 2017 & 2018 through Healthcare Marketplace or private insurance companies, or didn’t have coverage through employment, will pay penalty. Please note, if you have Medicare part A, you are considered covered and are not subject to any penalties (and having Medicare tax withheld from your paycheck has nothing to do with Medicare part A). Medicare part B is not considered a minimum level of health coverage. How much will be the penalty in 2017? What should I do if I received credits towards my medical insurance premiums in 2017? Expect to receive Form 1095-A from your insurer or Marketplace in the mail and bring it to your tax preparer along with other tax documents. Based on the information in this form the tax preparer will be able to calculate whether you received too much in advance Premium Tax Credit or too little. If too much, you will have to repay it back and if too little, you’ll get extra refundable credit on your tax return. The 2017 tax year Form 1040 filing deadline is April 17, 2018. Extension to file can be obtained before April 17, 2018; it will allow filing individual tax return before October 15, 2018. Please note, extension to file late does not mean extension to pay tax late, therefore all 2017 taxes must be paid before April 17, 2018 to avoid a penalty for late payment. 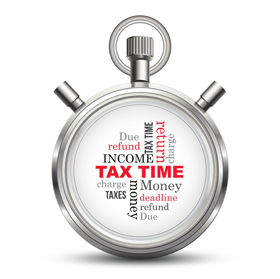 The 2017 tax year Form 1120-S (S Corporation) and 1065 (Partnership) filing deadline for calendar year taxpayers is March 15, 2018. Extension to file can be obtained before March 15, 2018; it will allow filing business tax return before September 17, 2018. C Corporation’s filing deadline (Form 1120) for calendar year filers is April 17, 2018, and 6-month extension can be obtained before that date. Please note, extension to file late does not mean extension to pay tax late. 2017 is the last year with the top individual income tax bracket of 39.6% for single taxpayers with taxable income of $418,401 or more ($470,701 or more for Married Filing Jointly). Starting January 1, 2018 the individual and corporate income tax bracket were significantly lowered thanks to the Tax Cuts and Jobs Act (more on this in our next article). There are some exceptions to capital gain rates, for example, from sale of collectibles or small business stock that is taxed at 28%. Unrecaptured Section 1250 gain from selling real property is taxed at a maximum of 25% rate. An employee’s Social Security portion of FICA remains the same at 6.2% in 20147, and Medicare portion of FICA at 1.45%. Medicare tax is increased by 0.9% for earned income in excess of $250,000 for Married Filing Jointly, $125,000 for Married Filing Separately and $200,000 for any other filing status. Additional 3.8% Medicare tax applies to net investment income in excess of $250,000 for Married Filing Jointly and Qualifying Widowers, $125,000 for Married Filing Separately and $200,000 for any other fling status. Non-resident individuals who obtained ITIN (Individual Taxpayer Identification Number) after January 1, 2013 please note that your ITIN will expire in 5 years unless you file your tax returns at least 1 (one) time during the last 5 (five) years. If your ITIN was not used on any of the tax returns for 5 (five) consecutive years, it will expire and you would need to re-apply. The Adjusted Gross Income (AGI) threshold for deducting medical expenses as an itemized deduction is 7.5% for 2017 and 2018. Beginning January 1, 2019, all taxpayers may deduct only the amount of the total unreimbursed allowable medical care expenses for the year that exceeds 10% of their adjusted gross income. Effective 2017 deferral limits to 401(k)/403(b) plans remained the same at $18,000 per year for individuals under age 50, and at $24,000 for individual taxpayers age 50 and over. The new Modified Adjusted Gross Income (MAGI) limits affecting deductions for traditional IRA contributions in 2017 are: Singles and Heads of Household - $62,000-$72,000, Married Filing Jointly - $99,000-$119,000, Married Filing Separately - $0-$10,000. For Married Filing Jointly with a spouse not active participant in IRA plans MAGI phase-out limit is $186,000-$196,000. Contribution limit to IRA accounts has not changed for 2017 and remains at $5,500 for taxpayers under 50, and $6,500 for taxpayers age 50 and over. The new Modified Adjusted Gross Income (MAGI) limits affecting deductions for Roth IRA contributions in 2017 are: Singles and Heads of Household - $118,000-$133,000, Married Filing Jointly - $186,000-$196,000, Married Filing Separately - $0-$10,000. Contribution limit to Roth IRA accounts has not changed for 2017 and remains at $5,500 for taxpayers under 50, and $6,500 for taxpayers age 50 and over. Child Tax Credit remains at $1,000 per child. Child Tax Credit phase-out begins for Single and Head of Household at $75,000, for Married Filing Jointly at $110,000 and for Married Filing Separately at $55,000. The exclusion for the estate tax is indexed for inflation and for 2017 will equal to $5.49 million ($5,490,000). The gift tax exclusion remains unchanged in 2017 at $14,000 per person.